Bring It On 20th Anniversary Edition super deluxe 4-CD box set containing the Mercury Prize winning album remastered by Frank Arkwright at Abbey Road studios and 35 previously unreleased tracks. 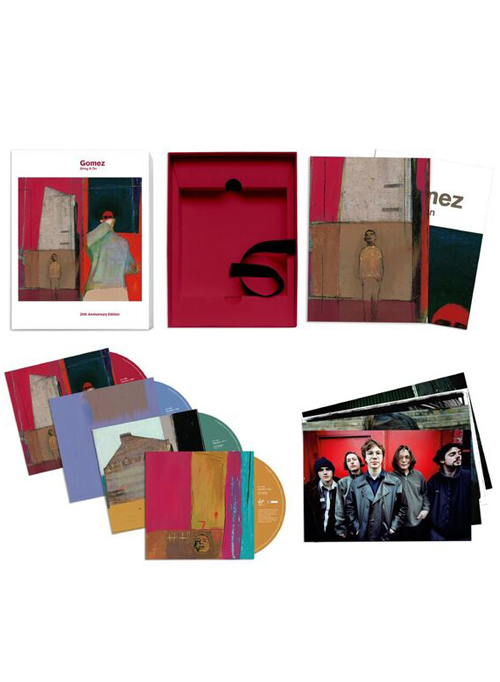 The collection features 25 demos recorded between January 1996 and August 1997 and 13 songs never released in any form by Gomez, including covers of Neil Young's "Unknown Legend" and T-Bone Walker's "Mean Old World" plus the band's complete 1998 Glastonbury performance and BBC sessions. Package includes a 10,000-word essay by music writer Paul Stokes, with new interviews with the band and those close to them, plus rare photos & memorabilia. Limited edition of 3,000 CDs. On Tracks 1 - 3 originally released as HUTT95; 4 - 6 HUTT97; 7 - 9 HUTT105. Tracks 10 - 20 recorded on Fostex X-18, mixed to CDR in Southport. April - July 1996 (track 12 originally released on HUTLP64). Disc Three Record Company Demo Tape (August 1996 - August 1997) New transfers of the original 4-track cassette tapes. Recorded on Fostex X-18. Mixed by Ian Ball, October 2017.